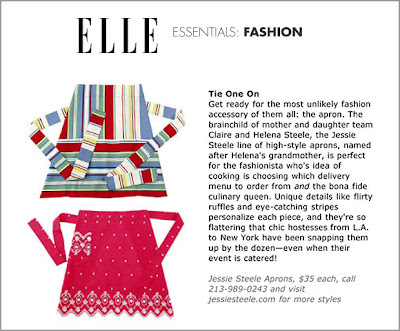 Jessie Steele has been featured since 2004 in Elle magazine, and once got the Big "O"k from Oprah on must-haves in the kitchen. Jessie's beautiful pieces have appeared in Desperate Housewives and many articles since then. 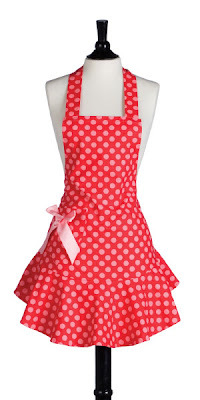 I have been searching for a perfect apron with little success when my friend Miss Fonda showed me a couple on a site, after explaining to her exactly what type of apron I was longing for. Leave it to Beaver, I was in Pleasentville! Later that evening it had me obsessively looking high and low for other styles. I've been wanting a really flattering fit for an apron and it seems that I have succeeded, buying one that was very Parisian/French toile inspired. I should really talk about the trip to Nice I took this past April. Perhaps tomorrow. Check out Jessie Steele's Fall/Holiday 2009 collection. 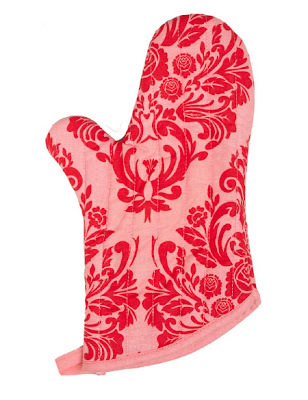 She also makes an array of matching oven mitts and tea towels. There's even collections for men, as well as for your little helpers - with mini versions (children's sizes) of the original aprons. Steele is also branching out to Hair Salon aprons which makes me want to cut hair, even though I would be über awful at it! Making dinner in the kitchen has never been sexier! love them! glad you found one you like!! By the way, I had no idea you were a makeup artist! Yeah, I have been set on finding a good one of these!